Peter Hannan started the food supply company 25-years-ago and supplies meat products to top restaurants across Northern Ireland and to the public from factory outlet shop – the Meat Merchant – in Moira. 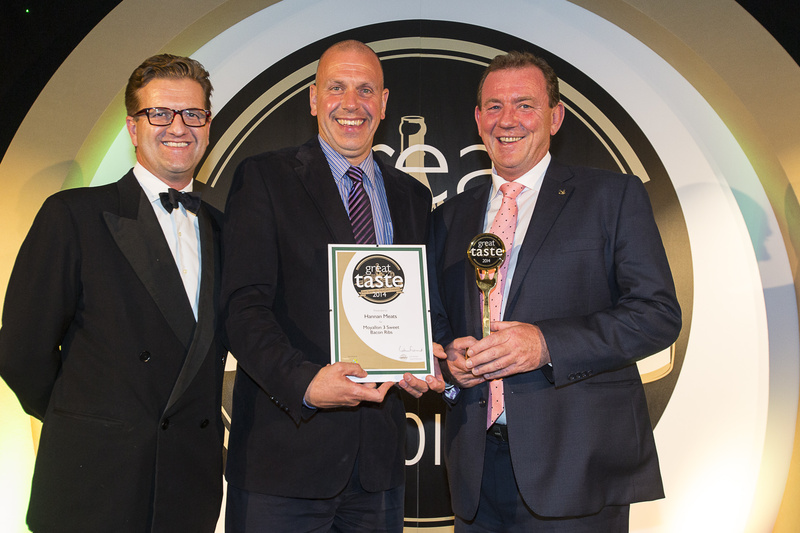 “In my opinion the Great Taste Awards are the only awards scheme worth entering. We have replicated our success from 2013 which is a fabulous result and shines a spotlight on our products”, Peter said. Organised by The Guild of Fine Food the awards are the industry benchmark for specialty food and drink. Products are blind tasted by a panel of experts and judged solely on taste. One to three stars are awarded by a panel of over 400 judges made up of industry experts including chefs, food critics and retail buyers. Judges blind tasted 10,000 products over a seven-week period and for the first time a judging session was held in Belfast. Sales of Hannan Meat’s premium products have rocketed since the company joined the Great Taste winners’ roll call and Peter says this is because, “every buyer in the world waits for the Great Taste results, when it comes to choosing the best suppliers the work has already been done”. The prolonged after effects of the 2009 recession and increased competition from supermarkets has seen a large number of independent retailers shut up shop, but Peter thinks consumer buying habits are changing and farm shops and delis are growing in popularity because quality is more important than price. “Nowadays people are eating less meat but are buying quality products and we are specialists when it comes to supplying meat products. “Supermarkets lack food passion and mass production is their key focus. We do not mass produce our meat products and have a unique ageing process which sets us apart from our competitors”, Peter said. Hannan Meat’s beef loins are dry aged over a period of 28 to 45 days in a salt chamber containing a 12 foot high solid wall of hand–cut Himalayan rock salt bricks to produce a unique flavour. This was the first chamber of this type to be used in Europe. In total Northern Ireland food companies including Maud’s Ice Cream, Suki Teahouse and Thompson’s Family Tea won 264 Great Taste Awards, with 11 in the highest ranking three stars category and for the second year running The Yellow Door Deli were winners in the Farmhouse and Deli category with their Strangford Prawn and Comber Potato Soup. This fantastic result highlights the abundance of quality food products available locally and with food experts, top chefs and customers agreeing that Hanna Meats products taste great, maybe a trip to Moira is required to purchase some Moyallon 3 sweet bacon ribs for myself. Visit The Meat Merchant website for product information and details about opening hours. This entry was posted in Features and tagged Great Taste Awards, Guild Of Fine Food, Hannan Meats, Himalayan rock salt, Maud's Icecream, Moyallon 3 sweet bacon ribs, salt chamber, Suki Teahouse, The Meat Merchant, The Yellow Door Deli, Thompson's Family Tea by Michelle Loughran. Bookmark the permalink.